The old iron fountain had seen better days; that’s for sure. 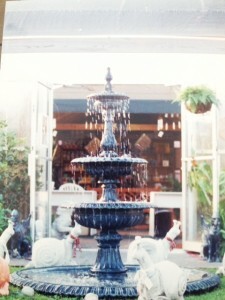 Many, many years ago (over 20 now) it was the star of a brand new garden shop, and its place of prominence was at the very center of the entrance…the shiny black finish was reflected in the pool of water filling the large, shallow basin. Maybe some of you remember when you had to walk around it, in all its glory, to reach the greenhouse. Though I have to say I wasn’t overly fond of the giant snails in this old photo! 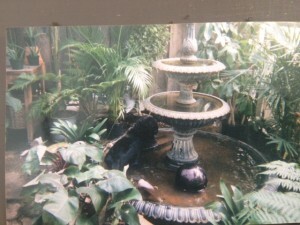 Can you see the dog in the fountain? The beautiful fountain was a fixture it seemed. Soon, the neighborhood dogs discovered the cool water in the large basin – it was a common sight to see a large lab or some other dog (Where did they come from anyway?) lolling in the water, tongue out, happy, happy. Keeping the fountain filled was a chore, and we quickly discovered a definite flaw in the design. The basin was too shallow to hold enough water – ever! 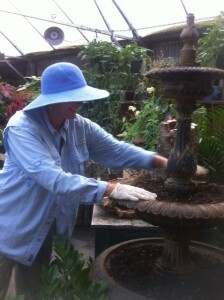 So, to keep the fountain running consistently, we had to fill it continuously. Boy, the dogs really loved that. They kept coming…cool, running water any time they wanted it – such a treat! After many years of fighting this, we decided to move the fountain into the greenhouse, but after one disastrous attempt to use it for a glorified goldfish pond (Note: Goldfish do not like iron or rust. ), we finally gave up and it met it’s inglorious fate stored under a table…the enormous basin turned upside down and covered with plastic. The top tiered portion ended up outside, leaning precariously on its side, a sad sight for anyone who remembered it in its heyday. I’d been wanting to move the top portion and plant it, but busy seasons came and went and there just didn’t seem to be the time or inclination (It is a very heavy piece of iron!). This summer, though, Jamie found the perfect spot in the greenhouse, and I planted it up. 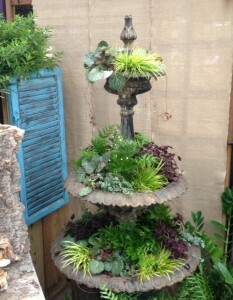 It has a new life once again as a fixture of Oak Street Garden Shop! 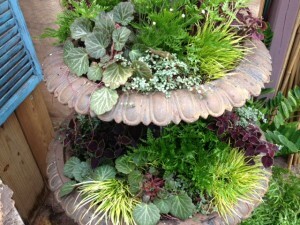 Because the three basins are designed to hold water, the plants needed to be those that don’t mind moisture. I also wanted to have enough plants cascading to create a “fountain” effect, as well as some to create fullness but not get too large. We’ll see how it grows out. Saxifraga stolonifera, strawberry begonia, was the first plant I chose. These are wonderful perennial groundcovers in moist, shady spots of the garden. Hopefully they will spread and cascade over the edge happily in their new home. Next I added a dark leaved trailing coleus. 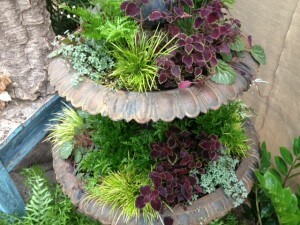 Yes, there is a coleus that really spills! In addition, I tucked in a bit of pilea ‘Aquamarine’ – this plant seems to be able to grow in any conditions and I’m testing it here to see how it does. That’s one of the luxuries of working in the greenhouse – we can always substitute another plant if need be! One of the filler plants I used was a tiny grass, Acorus minimus – all the acorus love moisture so it should do well. I rounded out the filler plants with a few ferns and another bog plant called Syngonanthus chrysanthus ‘Mikado’. This is a definite test since we know next to nothing about this plant; however, the fountain basin should give it the boggy conditions it is supposed to prefer! I’m glad the fountain has a new life and hope the planting grows out the way I envision it. The large basin is in yet another new spot outside, leaning against a sturdy wall. Hmmm… what next for it , I wonder? Only time will tell. This entry was posted in Container Gardening, Fountain, Project and tagged acorus minimus, container gardening, pilea, planting a fountain, saxifraga stolonifera, strawberry begonia, syngonanthus chrysanthus mikado, trailing coleus on August 27, 2013 by Kris Blevons.